(nee Ozga) Found Peace on Saturday, September 24, 2016 at the age of 57 years. Preceded in death by her parents, Stanley and LaVerne Ozga. Loving wife of Kenny. Dear sister of Greg (Ann) Ozga and Lynn (Bob) Klemm. Loving aunt of Dan (Jamie) Ozga and Lauren (Anthony) De Francesco. Special great-aunt of Alex and Ben. 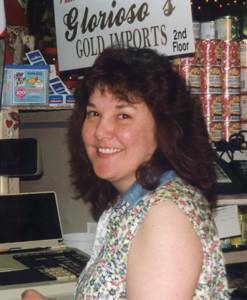 Karen was a long-time, dedicated employee of Glorioso’s Italian Market. She will be greatly missed by her extended family and customers at the store. Family and Friends will gather at the Suminski / Weiss Funeral Home, 1901 N. Farwell Ave. Milwaukee, WI 53202 on Saturday, October 8, 2016 from 4:00PM until the time of Memorial Services at 7:30PM.